We understand the challenges and pain that delivering open enrollment every year entails. It's the largest single drain on HR's time, with months of planning and, of course, "crunch time." It doesn't have to be so hard! Whether you have recently completed an annual open enrollment, or are planning one now, you need to know the secret that will eliminate much of the pain during your next open enrollment and throughout the year… automating benefit enrollment reporting with electronic carrier connections through Sage HRMS Benefits Messenger! HR executives, benefits managers and anyone with a vested interest should consider attending the free live webcast to learn how to deliver your annual open enrollment successfully, reduce benefits costs, and improve the overall employee experience! Learn the basics of electronic carrier enrollment reporting (carrier connections) – No techspeak! Discover the value of using electronic carrier connections in your open enrollment process. 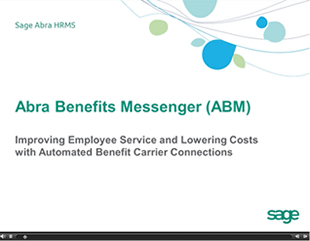 See a Live Demo and learn about the key capabilities of Sage HRMS Benefits Messenger.